With the ability to shave any dry ice media input through patented feeder technology, the SDI Select™ series opens new cleaning opportunities to suit your application's need, and can be as gentle or aggressive as necessary - with blasting pressures ranging from 20 to 300 PSI - covering the widest range of applications in a single machine in the industry. We provide solutions for any budget with the widest selection of blasting machines and nozzles available anywhere in the world today. Whatever you need to clean, we can help you find the right solution for your application. 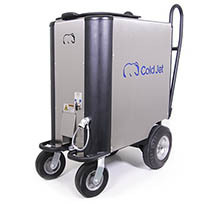 Cold Jet Dry Ice Blasting machines turn your cleaning problems into solutions. 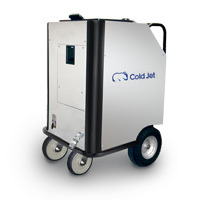 The Cold Jet Performance Series line of dry ice cleaning machines provides unparalleled patented technology, ergonomics and safety in a user-friendly package delivering a full range of reliable performance from gentle cleaning at 20psi (1.4 bar) up to aggressive blasting at 300psi (5.5 bar). Our mid-level machine, the Aero 40FP is a full pressure dry ice cleaning system that includes brand new radial feeding system technology that is aerodynamic loading to reduce wear on pads and rotor; utilizes a compact motor that reduces weight and lowers power consumption; includes an enhanced rotor that provides pulse-free blasting and precision feed rate control; and has an onboard pressure regulator. Customized with accessories that will provide the best clean for your environment, the Aero 40FP provides new technology in a proven design. Our top-of-the-line machine, the Aero 80FP is a full pressure dry ice cleaning system that includes brand new radial feeding system technology that is aerodynamic loading to reduce wear on pads and rotor; utilizes a compact motor that reduces weight and lowers power consumption; includes an enhanced rotor that provides pulse-free blasting and precision feed rate control; and has an onboard pressure regulator. Customized with accessories that will provide the best clean for your environment, the Aero 80FP provides premium technology in a proven design. 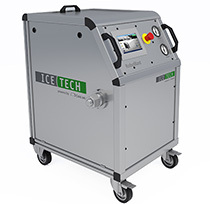 The IceTech Industrial Series line of dry ice cleaning machines provides the perfect universal dry ice blasting experience for many industrial applications, with advanced features and an operational versatility that make it suitable both for lighter applications and for extremely heavy duty cleaning. Evolve the way you clean your equipment with the enhanced Xcel 6. Designed with advanced operating principles, the Xcel 6 maintains a smooth cleaning performance while enhancing dosing disc operation. 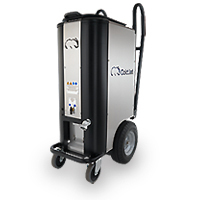 With a small footprint and a stainless steel frame, the Xcel 6 is designed to provide a reliable cleaning solution with minimal air requirements. 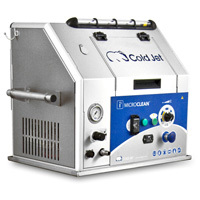 The i³ MicroClean utilizes Cold Jet's patented shaved ice and feeder technology. Our precision electric i³ MicroClean delivers a comprehensive and precise cleaning solution for delicate substrates. No other system on the market cleans so powerfully, yet so gently. The new i³ MicroClean brings enhanced performance and extended operation to the revolutionary table-top cleaning system by Cold Jet. The i³ MicroClean builds on Cold Jet's patented shaved ice and feeder technologies and introduces advanced MERN nozzle technology to deliver a complete precision cleaning solution. The i³ MicroClean thoroughly cleans small, complex cavities and crevices that other methods cannot reach, as well as cleaning delicate surfaces faster than traditional cleaning methods - without abrasion or disassembly. 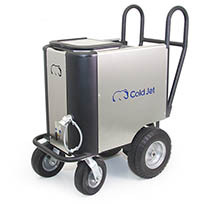 Introducing the Aero C100 Pneumatic - the amazing all pneumatic dry ice blasting system from Cold Jet. Get a superior clean never before possible in a pneumatic machine. The Aero C100 is twice as fast and supports twice the hose length of previous pneumatics - and the new SureFlow Hopper system ensures you'll never be a victim of clogged ice again. The Aero C100 lets you work smarter, not harder. 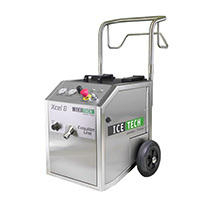 The IceBlast KG6 is suitable for companies that have a limited number of short cleaning tasks. The machine is unique due to its size and operation principles. Its compact size allows easy use in production areas. IceBlast KG6 has adjustable pellet dosage, and various pressures can be selected depending on the coating to be removed. The machine is highly effective due to the self-adjusting dispensing system that requires a minimum of maintenance. Our base machine, the Aero provides reliable performance in an industrial design. A light weight, compact, single-hose dry ice cleaning system, the Aero utilizes our patented SureFlow system that features an isolated, insulated hopper that reduces sublimation; hopper agitation that prevents clogging; radial feeder to provide smooth cleaning performance; and aerodynamic fittings to minimize air requirements. Customized with accessories that will provide the best clean for your environment, the Aero is an environmentally responsible cleaning solution at an affordable price. Introducing the Aero 40 - the benchmark in dry ice cleaning. The Aero 40 delivers a complete clean you can rely on every time you use it. And with its variable pellet feed, durable welded steel frame, sealed lubrication system, and SureFlow System with patented isolated hopper, advanced agitation and insulation, the Aero 40 sets the bar extremely high for a dry ice blasting system. Introducing the Aero 40 HP - the benchmark in dry ice cleaning. The Aero 40 HP delivers a complete clean you can rely on every time you use it. And with its variable pellet feed, durable welded steel frame, sealed lubrication system, and SureFlow System with patented isolated hopper, advanced agitation and insulation, the Aero 40 HP sets the bar extremely high for a dry ice blasting system. Introducing the Aero 80 Series - it quite simply changes the game of dry ice cleaning. The innovatiove Aero 80 employs Cold Jet's patented SureFlow System to ensure non-stop, hassle-free cleaning. And with best-in-class features (including: tilt-out hopper, trigger-activated hopper agitation, Super Multilayer Insulation, and flat-free wheels) the Aero 80 will help you clean like never before. Introducing the Aero 80 Series - it quite simply changes the game of dry ice cleaning. The innovatiove Aero 80-HP employs Cold Jet's patented SureFlow System to ensure non-stop, hassle-free cleaning. And with best-in-class features (including: tilt-out hopper, trigger-activated hopper agitation, Super Multilayer Insulation, and flat-free wheels) the Aero 80-HP will help you clean like never before. 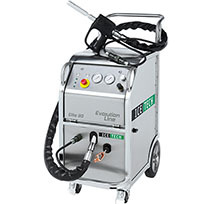 The Aero V is a lightweight, compact and powerful dry ice blast cleaning system. The Aero V is perfect for short runs or periodic cleaning needs with the superior performance of single-hose blast technolgy. The previous generation i³MicroClean table-top cleaning system used Cold Jet's patented shaved ice and feeder technologies to deliver a complete precision cleaning solution. The i³MicroClean thoroughly cleans small, complex cavities, as well as cleaning delicate surfaces faster than traditional cleaning methods - without abrasion or disassembly. The innovative SDI-5 uses dry ice block, pellets, or nuggets to create a versatile blast cleaning medium. Flexibility with dry ice media provides an extremely wide range of cleaning applications. The AeRO 75 patented aerodynamic rotor and pad design assures high reliability and smooth pulse-free blast flow at all blast pressures and media flow ranges for superior cleaning, operator comfort, and less waste. The advanced AeRO 75-DX adds high-pressure capabilities, a slide-out hopper, enhanced standard accessories and other benefits to provide the results you need for any demanding application. Single-hose all-pneumatic dry ice blast cleaning system. Dual-hose all-pneumatic dry ice blast cleaning system.